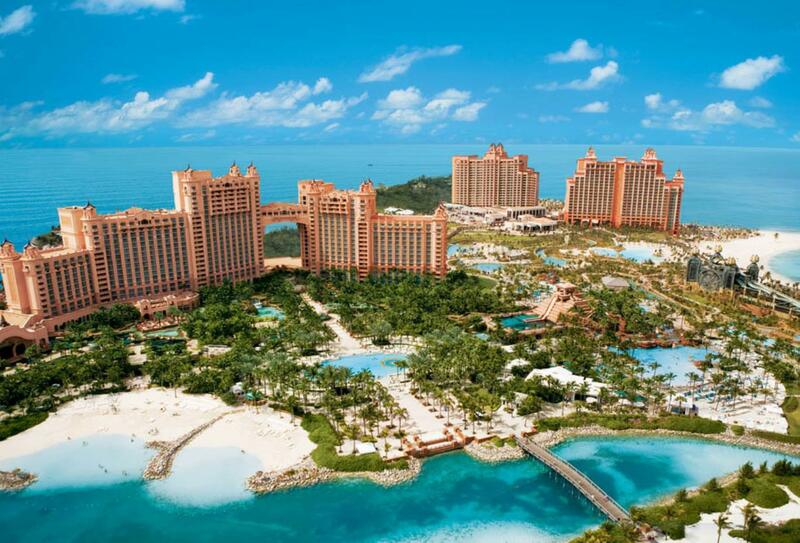 Splash into the many aquatic adventures Atlantis, Paradise Island has to offer. Atlantis, Paradise Island has a variety of freshly unique water experiences included in their 14-acre waterscape. 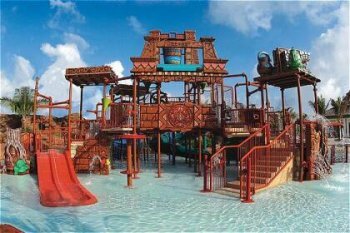 Take a plunge on one of the nineteen slides, pools and aquatic escapades Atlantis offers its guests. Children's pools are dotted throughout the property. Guests must be 48 inches or taller to ride water slides. Lazy River Ride - Fun for the whole family. Enjoy a relaxing and tropical ride. Sitting in a circular innertube, a gentle current slowly carries around a quarter-mile loop. Located outside the Beach Tower. Pools - Atlantis has six pools to offer their guests. Royal Baths Pool is a beautiful pool decorated with colorful tile design on the bottom. Palm trees line the pool for shade if you want it. Located at the Royal Towers. The Mayan Temple Pool is also located at the Royal Towers and is the ending point for the Mayan Temple waterslide. Great spot for swimming and sunbathing. The free form Lagoon Pool is located at the Coral Towers. The River Pool is a zero-entry pool, which feels like walking into the ocean as it gradually gets deeper. Located at the Beach Tower. The fabulous Grotto Pool is located near the Power Tower is also a zero-entry pool. It has a two beautiful waterfalls and a grotto you can stand in. Great place to bring the kids. The Baths Pool is surrounded by huge columns with heiroglphics. This pool holds nearly 750,000 gallons of water and is five feet deep at the center. Beaches - Atlantis guests can enjoy two postcard worthy beaches. Paradise Lagoon Beach is a 7-acre beach offering snorkeling, paddle boats and other water sports in a protected environment. South Paradise Lagoon is located outside the Royal Towers while the North Paradise Lagoon is located outside the Coral Towers. Atlantis Beach is miles and miles of white sand beach. Lounge chairs, umbrellas and beach towels are available. Great place to bask in the Bahamian sun. Power Tower -The newest addition to the Atlantis waterscape. Contains four thrilling waterslides. The Abyss which begins with a 50-foot almost vertical drop, the ride is about 14 seconds long and is 200-feet-long. You slide in and out of darkness and end in an underground lair. The Drop is accessible from the river. This slide allows you to journey up the Tower while you are still in your innertube via a water-propelling system. Then you are spiraled down through the Tower's dark center. The Falls is another upward-pushing system where riders are dropped 58 feet to ground level and then propelled up through twisting tubes. The Surge starts you at the towers top level, ending in a flash flood. Mayan Temple - Located just beyong the Royal Towers. The Mayan Temple contains five water slides. Leap of Faith is for the bold and daring! It's a 60-foot literally almost vertical drop that shoots riders through a clear tunnel into a shark-filled lagoon. Not for the faint hearted! The Serpent Slide is a five-story corkscrew slide. Twising and turning at first, then you flow into a clear tunnel which takes you through a shark-filled lagoon. For the competitors, try the Challenger Slides. Challenge a friend or family member to a high-speed race on one of the two side-by-side waterslides. There are even time clocks at the bottom of the slides to see who's the winner. The Jungle Slide is built into the heart of the Temple. This slide takes you through exotic jungles and caves. A high-speed slide. Dolphin Cay - A 14-acre bottlenose dolphin habitat, one of the most impressive in the world. There are several programs you can choose from. The Shallow Water Interaction which puts you in waist-deep water. Maximum of ten guests, this 30 minute program is great for smaller children and first timers. Wetsuits, personal locker, beach towel and non-alchohalic beverages are provided. The Deep Water Swim is reserved for only six guests at a time. You snorkel along with the dolphins and are given a hand-held water scooter which shoots you through the water. You will also get to experience the 'foot push' where the dolphin will propel you across the lagoon. Children must be over ten to participate. There's also the Trainer For a Day program. This is a six hour day in the life of a trainer. You enjoy the deep water swim and sea lion training program. A backstage tour of the facility and side-by-side work with the on-site Veterinary Hospital is also included. Children must be over ten to participate.